Western flower thrips (WFT) Frankliniella occidentalis continues to be a serious pest of floriculture crops in New England. WFT damage plants directly by feeding, and indirectly by acting as vectors for the tospoviruses impatiens necrotic spot virus (INSV) and tomato spotted wilt virus (TSWV). Depending on environmental conditions and nutrient levels, WFT females lay 150-300 eggs during their lifetime. Eggs are inserted in leaves, bracts, and petals and hatch in about a week into larvae, which feed in flower buds or terminal foliage. The eggs of WFT are well protected and in general, pesticide sprays are ineffective against them. The first larval stage lasts one to two days and second larval stage, two to four days. Toward the end of the second larval stage, the thrips stops feeding and drops or enters the soil or leaf litter and becomes a prepupa, which is a nonfeeding stage that lasts one or two days before pupation. Winged adults then emerge from the pupal stage in one to three days, depending upon temperature. Because the prepupae and pupae are mostly in the soil, these stages are not affected by insecticides applied to the foliage. Currently there are no recommendations for soil drenches aimed at thrips pupae. The life cycle is completed in two to four weeks. We believe that WFT do not overwinter outdoors in Massachusetts but WFT are known to overwinter in soil and clover in the Mid-Atlantic states and southern Pennsylvania. In Massachusetts greenhouses, WFT can be found year-round whenever temperatures are favorable for their development and plants, including weeds are available for food. Life Cycle drawing credit: See references - Sanderson J.P. 1990. Western Flower Thrips Biology and Control. In addition to direct feeding injury, WFT vector two tospoviruses, the impatiens necrotic spot virus (INSV) and the tomato spotted wilt virus (TSWV), both of which can be identified using on-site test kits. Of the ten known types of tospoviruses, only two-TSWV and INSV-infect ornamental plants, but both infect over 600 species of ornamental plants. Almost all greenhouse crops are susceptible except for poinsettias and roses. Thrips transmit both types of viruses in greenhouse and field crops. Seven species of thrips are vectors for TSWV, but the only confirmed vector for INSV is WFT. TSWV is a problem mostly on vegetable plants such as tomatoes and peppers, while INSV is the predominant tospovirus found in ornamentals. During feeding, saliva is injected into the plant cell and the contents withdrawn. When tospoviruses are present in the saliva, these are transmitted to the plant during the feeding process in as little as 15-30 minutes. Only the two larval instars of WFT can acquire the virus. Adult WFT do not acquire the virus from tospovirus-infected plants because tospoviruses pass right through the gut and do not enter the salivary fluid. Once thrips acquire INSV or TSWV, virus multiplies within the salivary glands and other tissues of the thrips and is later transmitted to new plants by the feeding of the infected thrips after it has reached the adult stage. Adults however, do not transmit the virus to their young and there is no transmission from adult to egg. Overlapping generations of thrips within a greenhouse may result in continuous virus transmission. It is difficult to diagnose tospovirus infections of greenhouse plants using visual symptoms alone. Symptoms vary depending on plant species, cultivar, developmental stage of the plant, and environmental conditions. Tospovirus symptoms often mimic symptoms caused by other problems such as nutrient deficiencies. General symptoms include leaf spots, necrotic areas, mottling and ringspots or target marks. Some plant species die from the virus, while others survive, but are unsalable. Young plants are especially vulnerable to infection. There is no cure. As soon as INSV or TSWV is detected, infected plants should be discarded and a intensive thrips management program implemented. Tospovirus infections may be systemic (i.e., virus symptoms occur throughout the plant) or non-systemic (i.e., the virus symptoms are confined to a specific part of the plant). Tospoviruses, however, may be present even though the plant shows no symptoms. Using On-Site Test Kits to Detect Tospoviruses On-site test kits can be used to determine whether or not tospoviruses are present in greenhouse plants. If a plant is suspected of being infected with a tospovirus because the plant is showing symptoms of virus infection, a tissue sample can be collected from those parts of the plant showing symptoms. Even, when plants are systemically infected, tospoviruses do not spread evenly throughout the plant, so careful selection of tissues is crucial to the success of the test. Collect a sample from the part of the plant showing symptoms, including green or chlorotic tissues adjacent to the necrotic area. 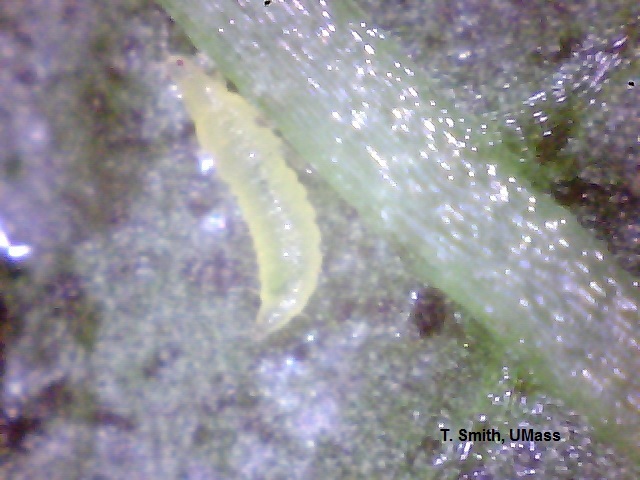 Thrips can also be collected from sticky traps and tested using the test kits. Companies that manufacture test kits available for on-site testing. Both companies have separate kits available for testing for INSV and TSWV. Early detection is critical to the control of WFT and to the prevention of tospovirus infections. Indicator plants and sticky cards are the best available means of providing early warning of thrips and TSWV/INSV in greenhouse production areas. Petunia plants (Petunia x hybrida) are excellent early indicators for the presence of WFT feeding and the transmission of tospoviruses because petunias are not systemically infected with either TSWV or INSV. The following petunia cultivars are excellent indicator plants for the detection of tospoviruses: Calypso, Super Blue Magic, Blue Carpet, Cascade Blue, Summer Madness, Burgundy Madness, Red Cloud, Super Magic Coral. Fava bean plants can also be used as an indicator plant. However, the virus is systemic in fava bean plants and once infected, plants should be discarded immediately so as to not serve as a source of infection. Check indicator plants for virus symptoms, which appear as dark-ringed lesions that develop around thrips feeding scars. To set up a monitoring program using petunias, first remove flowers. Thrips will preferentially feed on flowers, but flowers do not show virus symptoms and will attract WFT away from the leaves. Use a blue non-sticky card to attract thrips to indicator plants since WFT are more strongly attracted to blue than to other colors. Check plants each day, looking for WFT feeding scars, which are whitish and have an irregular outline. Brown or black-edged lesions will develop on the edges of thrips feeding scars within three days if a tospovirus has been transmitted. Control measures include removal of infected plants and WFT control measures, such as spraying, or exclusion of thrips. Infected plants should be placed in a closed plastic bag at the bench to avoid spreading virus-containing thrips to other areas of the greenhouse during the removal process. Use sticky cards to monitor adult thrips. Blue sticky cards are more effective in detecting thrips than yellow sticky cards. Therefore, blue cards are best used in thrips-sensitive crops. Yellow sticky cards are best used for general pest monitoring because they are also attractive to whitefllies, winged aphids, leafminers, fungus gnats and shoreflies. A 10 or 20x hand lens will help to distinguish adult thrips from pieces of peat moss or other debris. Attach cards to a stake with a clothespin so that cards may be raised as the plants grow. Place the cards just above the crop canopy in an even pattern throughout the entire greenhouse. Use a rate of at least one card per 1,000 sq.ft. with additional cards placed near the doors, vents and thrips-sensitive plants. Thrips will move on air currents. Visual inspections can be improved by blowing lightly into the blossoms or growing points. The carbon dioxide will bring thrips out of their protected areas. Flowers and plant tips can be shaken over a piece of paper for additional monitoring. Thrips populations will be highest when plants are flowering. Trap counts and keeping records are meaningful in two ways. Keeping records over time will provide information on what direction the population is changing and at what rate. This information is useful in determining the efficacy of a treatment or control measure. Tolerance levels or damage thresholds determine the damage that is likely to occur at a particular population level. Tolerance levels will vary depending upon the crop, its stage of growth, local market standards and whether or not either INSV or TSWV are present at the site. Record thrips counts on cards and correlate this information to the damage you see on your crops. Different crops have different susceptibilities. For example, Saintpaulia is very susceptible and treatment thresholds are lower than 5-10 thrips/trap/week. Begonias and poinsettias are much less susceptible to damage and thresholds are much higher. Also, plant propagators will have a lower tolerance threshold for thrips than finished plant growers. Some growers use a general tolerance level of 5-10 thrips per card per week. However, if INSV or TSWV is present, the tolerance levels for thrips is zero and a strict thrips control program should be implemented. The spread of WFT and TSWV or INSV from grower to grower is caused in two ways: by shipping tospovirus-infected plants (both propagative and pre-finished) and by shipping plant materials infested with tospovirus-carrying WFT. Growers are encouraged to choose plant vendors with care. The first step in managing thrips is to prevent thrips from entering the greenhouse. Monitor for thrips as soon as plants or cuttings are received. Keep thrips-infected plants isolated in a separate area to prevent them from moving throughout the range. Winged adults are weak fliers but may be carried on air currents and employee's clothing. Remove "pet" plants and avoid keeping leftovers such as holiday cacti and cyclamen. Remove all plant debris on benches and floors. If soil is present under greenhouse benches, treat the soil with a pesticide to eliminate the developmental stages of WFT. To accelerate the development of WFT pupae in the soil, and eliminate the emerging adults, close greenhouse vents and keep the house heated and empty for a week or more between crops. Note that one week may not be enough time. The use of yellow sticky traps will help to detect emerging adults. Use an insecticide to knock-down emerged adults. WFT prefer to feed on flowers, so the longer a crop can be grown without flowering the lower the thrips population will be. Keep flowers off of plants as long as possible to reduce populations. Screening can be used to mechanically exclude WFT. However, the screening material for WFT is so fine that proper ventilation is a challenge and this limitation should be considered. Also, screening will only be helpful if the source of infestation is from thrips migrating in from the outside and not from infected plant material within the greenhouse, which is most common. 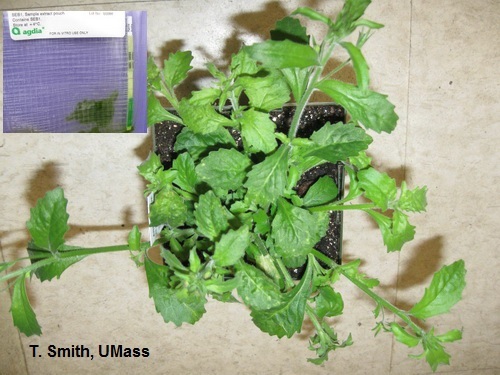 Weeds serve as host for WFT and INSV and managing weeds inside and outside the greenhouse is critical for thrips management. Maintain a 15 foot weed-free barrier around the greenhouse to help reduce thrips entry. A contact insecticide such as horticultural oil can be used outside the perimeter of the greenhouse prior to mowing or using herbicides. This will kill thrips on outdoor weeds and prevent them from entering the greenhouse to search for new hosts when weeds are mowed. Good sanitation controls Tospoviruses. entomopathogenic fungi, such as Beauveria bassiana, that attack all WFT life stages and kill in two to 14 days. Use of biological control methods should only be implemented as part of a well-planned IPM program. Biological control methods, should not be used when either TSWV or INSV is already present in the greenhouse. In all crops, soil drenches of nematodes such as Steinernema feltiae may be directed against western flower thrips pupae and prepupae in the soil. The following biological control program using natural enemies in combination with insecticides was tested for spring crops in commercial greenhouses in Massachusetts. Note that Amblyseius cucumeris is available in two formulations, sachets (packets of mites and prey in bran that act as slow release systems) and bulk formulation of mites on bran. The bulk release formulation is more effective than sachets, however, some growers found that sachet packets provide more protection to the the mites. Sample Biocontrol program for thrips management. Apply Hypoaspis miles (or Hypoaspis aculifer) to media. Apply Amblyseius cucumeris in bulk formulation to flats and benchtop pots, and to easily reached hanging baskets. Place Amblyseius cucumeris slow release sachets in hanging baskets that cannot easily be reached. Labor will be saved if this is done when baskets are being hung. If the cost of slow release packets is too high, baskets can be treated with imidacloprid (Marathon®). Treating just a portion of the crop with Marathon® will help to slow the development of pest resistance. Treat with compatible pesticide to reduce populations. Place Amblyseius cucumeris slow release sachets in hanging baskets that cannot easily be reached. Labor will be saved if this is done when baskets are being hung. If the cost of slow release packets is too high, baskets can be treated with Marathon®. Amblyseius cucumeris adults prefer to feed on 1st instar larvae and are unable to kill adult thrips, so early detection and a sound sampling plan is part of effective control. Amblyseius swirskii is another predatory mite being used. It is very similar in appearance to Amblyseius cucumeris. This mite performs better during warmer temperatures (summer) and in addition to thrips, it also consumes whitefly eggs. both species use pollen as a food source so when plants begin to flower, this can be supplemental food for these mites, especially if thrips levels are low. Orius insidious (Pirate bug) is a generalist predator feeds upon thrips, spider mites and pollen. Because Orius is slow to establish in the greenhouse, different types of banker plant systems have been investigated to encourage this predators development and establishment in the greenhouse. They are used in biocontrol programs when the weather warms in spring and beyond, in addition to other biocontrol agents already being used. Pirate bugs are released onto ornamental pepper plants that are in flower which serve as a banker plant attracting the thrips and harboring the predators. The following Orius program is suggested by Syngenta and Griffin Greenhouse Supply. As the weather warms, make 3-4 weekly releases of 1 Orius per 10 sq. feet. Release in an around blooming plants. Orius will feed on pollen in the absence of thrips and also other small pests such as spider mites and caterpillar eggs. Release Orius late in the day when the louvers are closed and thrips are active. Ornamental pepper plants have been used in spring crops as banker plants at a rate of one plant per 1,000 sq. ft of growing area. Recent research in Canada reported that the cultivar "Purple Flash" was more effective as a banker plant than the ornamental pepper variety "Black Pearl" which has been used over the past few years for this purpose. About 60-80 pirate bugs can be released per flowering pepper plant. The Orius will lay eggs in the same area where thrips lay eggs, usually in or near flowers. Pepper plants attract the thrips and also serve as indicator plants for early detection. As long as the pepper plants are in flower and producing pollen, the minute pirate bugs will reproduce on the banker plants. The adults will move across the greenhouse and kill first and second instar thrips larvae and adult thrips. Usually one release onto the banker plants is all that is needed. The drawback to using ornamental pepper plants is that the peppers need to be removed to keep plants continually flowering which is necessary to maintain the Orius population. Because of this, growers and researchers have been experimenting with the use of habitat planters for natural enemies. It has observed that the Cosmos "Sensation White" has been especially helpful in encouraging their Orius populations. Their habitat planters have also included Achillea, lantana, alyssum, catmint, dill and African marigolds. They release Orius on and around these planters. It has also been suggested to add a breeder pile of the predatory mite Amblyseius cucumeris to habitat planters to feed on the thrips attracted to the the pollen source while Orius populations grow. Canadian researchers also looked at castor beans, feverfew, gerbera, Lemon Gem marigold and sunflowers as potential banker plants. They reported that Lemon Gem marigold would not be acceptable as banker plants because very few of the Orius nymphs reared on this marigold developed into adults. This was also true for sunflowers, which were also susceptible to powdery mildew as well as thrips damage. There are many insecticides registered for WFT, but overuse of pesticides can lead to resistance in the WFT populations you are trying to control. While resistance is of concern, failure of chemical control is most often due to poor timing, poor coverage or other factors and these causes should be considered before assuming resistance. Most insecticides and miticides affect insects and mites in specific ways. These ways may be called the pesticides "mode of action". The Insecticide Resistance Action Committee (IRAC) is an organization of chemical companies and researchers that has classified insecticides and miticides into different modes of action groups. Each MoA group is assigned an Insecticide Resistance Action Committee Group number (IRAC code). Mode of action is the way a chemical works, so chemicals in different chemical classes may have the same or similar modes of action and be causes of pesticide resistance. MOA group numbers are found on many pesticide labels and are listed below for selected materials listed for managing WFT. Table 1. Pesticides labeled for WFT in greenhouses. Mention of a pesticide does not constitute an endorsement of any product and any omission from this list is unintentional. The pesticide label is the ultimate authority for pesticide use. Information on pesticide use is available in the current New England Greenhouse Floriculture Guide, A Management Guide for Insects, Diseases, Weeds and Growth Regulators. To delay development of resistance, a standard recommendation is to use long-term rotations among types of pesticides. Some growers make the mistake of rotating after each treatment, which will increase resistance. To delay resistance, use a given effective insecticide for 2-3 pest generations of WFT (2-3 weeks, depending on the season), then rotate to another insecticide with a different mode of action. Then, rotate to a third class of insecticides, and finally, return to the original material and repeat the whole process. When chemical control is necessary, spray pesticides two to three times five days apart based on greenhouse temperatures ranging from 70-85°F. Reduce the spray interval to 3 days if greenhouse temperatures are higher, and increase the spray interval to 7 days when greenhouse temperatures are lower. Treating at short intervals more than one time will control overlapping generations and reduce populations. Treatment decisions should be based on scouting records that include numbers of thrips, not only on the presence or absence of thrips. Treatments should stop when numbers of thrips have declined to an acceptable level. See section on monitoring. Note that it has been reported that populations of WFT have shown resistance to Conserve®. Continue to monitor WFT population levels to determine if additional pesticide applications are necessary. Eggs and pupal stages are unaffected by pesticide sprays, so make sure the spraying program lasts long enough to control newly emerged larvae and adults. Ideally, insecticides should be applied with equipment that produces very small spray particles (<100 microns). Small droplet sizes are best because they penetrate better into the protected areas of the plant where the thrips are found and can provide better control if coverage is thorough. Growers sometimes ask about adding sugar to their tank mix to improve the effectiveness of the insecticide. White sugar at a rate of 1 pound to 100 gallons, dissolved first in warm water, then added to the tank mix. In one study, white sugar added to Beauveria bassiana (Botanigard) increased mortality by 20 percent. It is believed that the sugar is an insect feeding stimulant. By stimulating feeding, the thrips had more contact with infected spores on treated leafs, resulting in better control. However, research by Raymond Cloyd, Kansas State University showed that the addition of brown sugar and other sweeteners to lure thrips from hiding does not work and in some cases can cause the growth of black sooty mold. Adding sugar may cause more feeding injury if the insecticide is not effective. Pesticides labeled for greenhouse use against WFT are listed in Table 1. The table shows the mode of action of each pesticide to help you plan your pesticide rotation schedule. Armando P. and R. Yates. 2011. Orius Banker/Companion Plants to Combat Thrips Population Spikes Griffin GGSPro. Brownbridge M., M. Skinner and B. L. Parker. 2000. Enhancing the activity of insect-killing fungi for floral IPM. Ohio Florists' Association Bulletin. January. p. 14-16. Hsu C. and W. Quarles 1995. Greenhouse IPM for Western Flower Thrips. The IPM Practioner 17(4) pp 1-11. Lyon S. 2002. Using Predatory Mites to Manage Western flower Thrips in Bedding Plant Greenhouses. Fact Sheet. Lyon, S., R.G. Van Driesche, T. Smith, P. Lopes, J. Sanderson, S. MacAvery, T. Rusinec, and G. Couch. 2001. Western flower thrips control in spring bedding plants: which formulation is best? Floral Notes 13 955: 8-10. Sanderson J.P. Western Flower Thrips Biology and Control. Long Island Horticulture News. August 1990, pp.1, 2, 3. Van Driesche R.G., K.M. Heinz, J.C. van Lenteren, A. Loomans, R. Wick, T. Smith, P. Lopes, J.P. Sanderson, M. Daughtrey, and M. Brownbridge. 1998. Western Flower Thrips in Greenhouses: A Review of Its Biological Control and Other Methods. Floral Facts, University of Massachusetts, Amherst, MA. Valentin R. Are Thrips Still Bugging You. GPN Magazine. April 2013. See also our factsheet Impatiens Necrotic Spot Virus and Tomato Spotted Wilt Virus and the Web Resources listed there. ATTRA's exhaustive "Pest Management Technical Note" on Sustainable Thrips Control contains tables of Species of Thrips in Greenhouses and the thrips life-cycle, information on crop scouting and trapping, and citations of new research on thrips, sticky cards and indicator plants. Includes lists of plants that repel thrips, predatory mites, pirate bugs and parasitoids, least-toxic or "soft" pesticides and insect growth regulators. Extensive References and Further Reading sections, plus lists of specialists in thrips control and of Biological Control Suppliers. North Carolina Cooperative Extension. Western Flower Thrips Adults for photos of adults and Western Flower Thrips Nymphs for nymph stage.